One hundred (a.k.a. 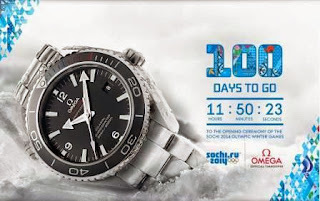 C) days to Sochi hardly seems possible. After a challenging year (still in progress) including elder care duties with family and many interesting freelance P.R. client projects, the pre-Games milestone for Russia's Winter Olympiad didn't exactly sneak up on me, but it does enforce some urgency to lock in travel details to get to the host city. Plans are going alright, though at a Siberian glacial pace. Found a hotel for opening ceremonies eve (and booked it! ), and soon my purchase of a state room aboard an Adler-docked cruise ship will be complete. That leaves the Super Bowl Sunday flight (via Frankfurt), ground transportation and a mobile device as the remaining "travel to do's" for Sochi. Happy to report I will be there. As was the case with Torino in 2006, my brain's been lukewarm to the whole lead up to Sochi. It's surprising the Olympic security story lines did not resonate more in media and conversations of recent months, trumped by the Russian law banter as the "controversy d'Olympiade" drummed with about the same six-months-out timing as human rights for Beijing, security for Athens, homeless rights for Vancouverites, etc. The good news is that the global public discourse about Russia's policies may emerge as a positive turning point (five, 10 or 20 years from now, hopefully things will be better as a result of recent protests and such). Thank goodness the Games will go on sans boycott. A few weeks ago I was fortunate enough to attend the Team USA Olympic Media Summit in Park City, Utah, to visit with many Sochi Olympic hopefuls and to learn about winter Olympic training underway at many venues across the USA and around the world. During the next 100 days, I'll strive to post daily some of the athlete photos and stories learned at the Summit, and to delve into Sochi Olympic sponsor activation, observations on Olympic public relations (good or otherwise) and Olympic travel or Sochi Cultural Olympiad items in the news. I'm most excited to witness the debut of women's Olympic ski jump and the combine male/female team events (ticket leads are appreciated). 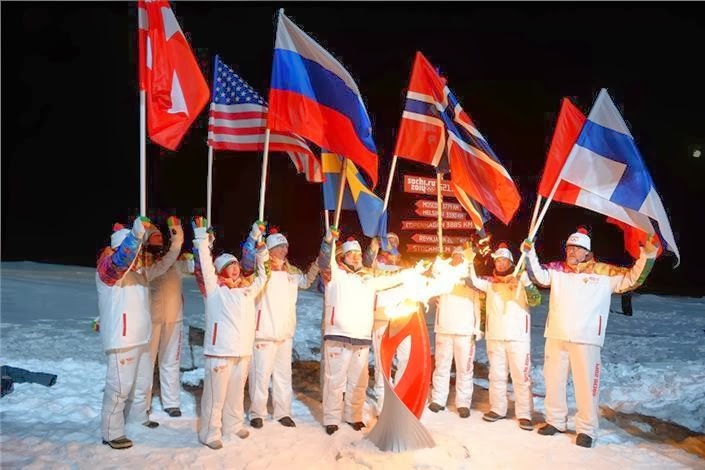 The Sochi Olympic Torch Relay now underway is also very interesting as the largest single-nation relay in history, almost taking the flame to the moon and back (they reached the North Pole a few days ago, as I understand it, and the notion of the Torch aglow under the Northern Lights is inspiring). What do you want to see and learn through this Olympic blog? Share via comments and I'll see what I can do. I wish I was going to Sochi! I got offered a volunteer position at the Team USA House, but had to decline it because I can't afford the trip. :( I'll be living vicariously through you and the other lucky ones that get to go! Thanks for your comment, Darcisays. A friend keeps an eye on Olympic sweepstakes options to enter/win travel to the Games. Will try to post about these in the future, in case it helps you or others get to Sochi. Cheers! I sure wish I was! In fact when Sochi was awarded the Games the idea of going was planted in my head. I'd been to Russia on a trip in high school and have wanted to go back since. Haven't been to a Games since Salt Lake (went to Atlanta for the duration) and have been itching to go again. But my wife and I had a baby in 2011, and that makes lots of things impossible! I hope you have a great time there, and with some luck I can manage to get to another one someday. I suspect this will be a rather different kind of Winter Games. It will be very interesting to hear first-hand impressions from winter veterans. Looking forward to your reports!